Few of us can manage our daily lives without mobile phones, tablets, laptop and desktop computers, along with routers, printers, and so much more. After a fire with even a slight degree of smoke, sensitive electronics like these can become contaminated. In post-fire situations, these devices may look visually okay, but that doesn’t mean they are. Therein lies the danger. Smoke seeping into these units can leave equipment prone to extreme overheating and premature failure. Even worse, once smoke has reached deep inside electronics, a thin black film often develops and adds insulating properties to advanced heat-producing electronic parts that were never intended to be insulated. The magnetic charge left by smoke can then cause circuits to short, leading to overheating. Smoke-damaged electronics can be a future safety hazard when various materials are contaminated and left in their damaged state. After smoke damage in areas where these devices are housed, here’s how best to proceed. Immediately unplug all electronics. Even when a device is in sleep mode, electrical energy enters the device and can further damage its components. Do not turn on any of the items to see if they are working. Make an immediate call to a professional for post-fire and smoke advice. A full charge of electricity can cause far more severe and lasting damage. Wiping soot from a device can be done carefully with a dry cloth, but that won’t remove the possibility of penetrated damage. Know this: Soot pushed by smoke causes contact everywhere and with everything in its path. Since smoke travels to cooler temperatures, contact will continue until the energy runs out. The main cause of damage is not soot, but the acidity in soot. Acidity destroys metals, which causes discolouration and disintegration. To prevent data loss in a tablet, mobile phone, or computer, maintain backup storage using CDs, DVDs or — even better — Cloud storage. Sometimes your electronics can’t be saved, so having warranty coverage in the event of a disaster can be critically important. 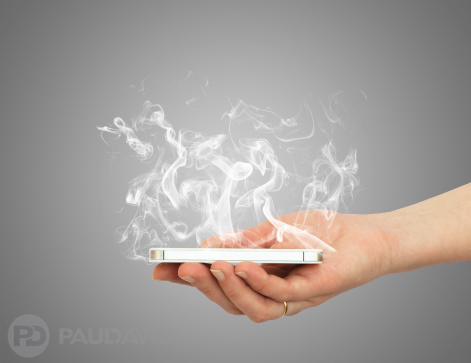 Paul Davis companies have the skill set to help you safely restore sensitive electronics. When in doubt, be sure to Call Paul!